The year-round family gift registry for Christmas, birthday, baby, and weddings. Your family members’ gift ideas go into Giftster and out comes a simpler way to give and get gifts that matter most... without the anxiety. 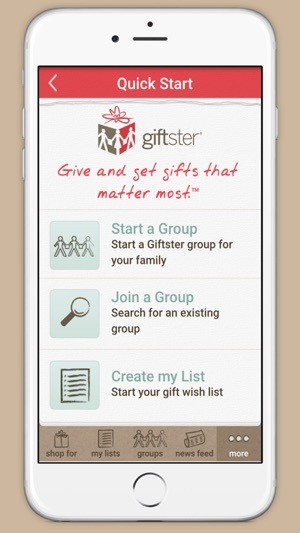 Giftster is the original lifetime gift registry, connecting family and close friends around gift giving occasions. Set it up once and use it year after year. * Join an existing group created from the app or the giftster.com website. 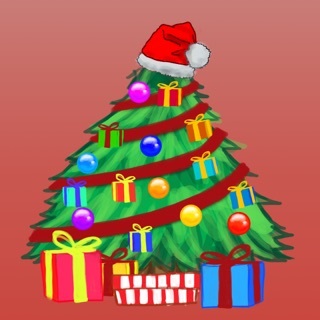 * Add a Secret Santa draw to your group at giftster.com and discover your secret pick and Secret Santa rules on your iOS device. Exclude picks and reuse a previous draw, too. * Add gift ideas to other member's lists, hidden from the list maker but everyone else can see them. How fun is that? * Already a member at giftster.com? 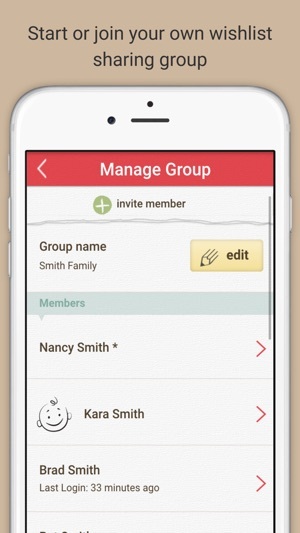 Log in the same way and all your lists, groups, and events are instantly visible on your device. With Giftster you become part of a small social network connecting family and close friends around gift giving occasions. If this is your first time using Giftster, you won't have any family or friends connected yet. Once you connect one or more of your family into a group, each family member logs in to update their own wish lists, and to view and reserve gifts on each other’s lists. - Everyone in your family can connect to you with this App - we built a version of Giftster that runs on just about every device. - Giftster instantly synchronizes changes to all devices, including your account at giftster.com. - Requires a network data connection or wifi to operate. This is release 5.1 of the app; got feedback? Please send to mobilesupport@giftster.com or call 01-612-216-5112. This latest version of Giftster includes 14 ease-of-use improvements and fixes known bugs. Reliable, Clever, and Easy To Use! I'm a busy mom and this has decreased the chaos at Christmas time like you wouldn't believe! Even the people in our family who don't have smartphones can use it with the website and now we can get the perfect gift for them every time! It's simple, clean design makes it easy for the grandparents to use. Not only does it have lists that you can reserve and purchase items from, but they also have a gift preferences page that can help you learn more about things they may want that aren't on the list. So many other great features too! I can't tell you how much this has helped my family. After searching and searching for something like this I finally found Giftster and can easily say it's the best wish list/gift registry there is out there! My whole family and extended family have used this app for Xmas 201. It has been such a timesaver and really made gift giving easier than ever. You know the gift you’re giving is something they really want because with Gifster they make their own list. You can see if someone else has already claimed the gift, (purchased it), so no longer any doubling up on the same present, best part is the recipient cannot see what has been purchased. Links can be added to the gift list making it easy to buy the correct item along with the cost so you know how much you are spending. There are so many more cool features I could go on and on but you get the idea. 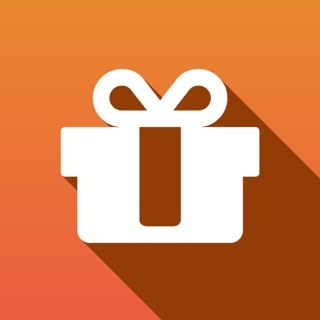 I highly recommend this app if you need a way to simplify gift giving within a group. I don’t know how I ever shopped before Giftster. Since I’ve found Giftster, this site/app has made shopping so easy. I invite my family and friends to join my group. I make a wish list. They make wish lists. Then we shop. We mark our items off the Giftster lists that we are purchasing for each other, so others don’t buy the same thing, but the list owner still stays surprised. You can then purchase the gifts from any online or retail store. You can even start a Secret Santa exchange! Giftster is so helpful not only for Christmas, but birthdays, bridal and baby showers, etc. 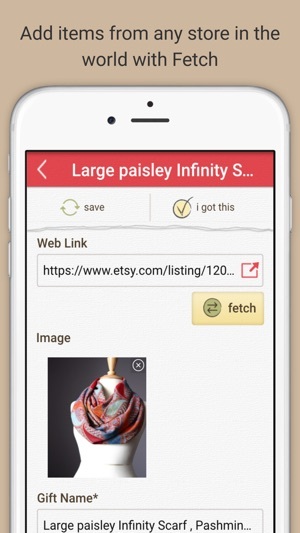 I can bring up my app on my phone while out shopping and check lists. Best of all, Giftster is free! 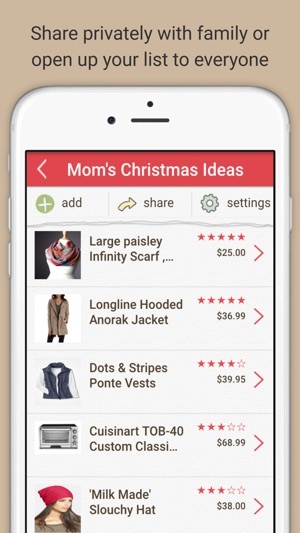 If you need help getting organized this holiday season, check out Giftster!